Manny Pacquiao blamed a shoulder injury for his defeat by Floyd Mayweather in Las Vegas, claiming it stopped him from using his right hand. American Mayweather, 38, outclassed his Philippine rival at the MGM Grand and was awarded a wide unanimous decision. Pacquiao, 36, said he thought he did enough to win the fight, despite most observers agreeing with the verdict. "Three weeks before the fight I got a tear in my right shoulder," he said. "It got better but it wasn't 100%." Mayweather started the brighter of the two and rocked Pacquiao with a number of right hand counter punches in the early exchanges. The Filipino came back at the American in the fourth round, stunning Mayweather with a left hand and again in the sixth round but was never able to back it up and Mayweather ran out a comfortable winner on the judges scorecards. Pacquiao said he wanted to have an injection in the shoulder before the fight but the Nevada Athletic Commission refused. Pacquiao's promoter, Bob Arum, claimed he informed the Commission of the injury five days ago and defended the decision not to cancel the fight, the most lucrative in boxing history. "Athletes always fight hurt and we felt the work that was done on the shoulder during training would enable him to use his right hand," said Arum. Commission chairman Francisco Aguilar said he first knew about the injury two hours before the fight, when Pacquiao's camp requested a doctor sit in his corner, a request that was denied. Mayweather, meanwhile, said he was carrying injuries to both arms and hands. "If he had come out victorious, I would have shown respect and said he was the better man," he said, after adding Pacquiao's WBO welterweight belt to the WBC and WBA titles he already owned. Mayweather, a five-weight world champion, also criticised those who doubted him, telling them he had made them "eat their words". "For years everyone said that I was scared and that I'd lose," said Mayweather, who is undefeated in 48 professional fights stretching back 19 years. "I made the non-believers into believers. I was the better man, the smarter fighter - more calculated, more patient. He was applying pressure but not landing many punches and I was just keeping my jab in his face." Six-weight world champion Oscar De La Hoya: "Call me old-school but I like the fans getting their money's worth by watching an action-packed fight. I'm just not into the boxing, running style. I like jumping out of my seat because a fight was existing." Former world heavyweight champion Lennox Lewis: "Some people want blood and get disappointed when they don't get it. Doesn't take away from fact that Floyd is a great technician." 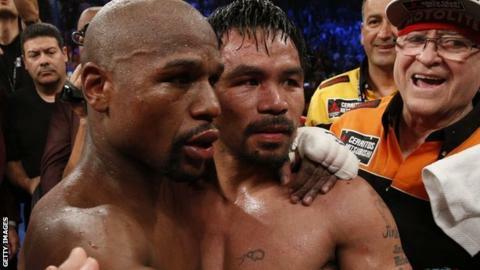 Mayweather, who said he was presented with a cheque for $100m (£66m) in his dressing room after the fight, also revealed he planned to relinquish his titles and that his final bout in September would be a non-championship fight. As well as the welterweight belts, Mayweather is also the WBC light-middleweight champion. Asked if his last fight might be against Britain's Amir Khan, Mayweather replied: "I'm not thinking about that. All I want to do right now is go home and rest." Mayweather's father and trainer, Floyd Sr, criticised those who booed him before and after the fight. "My son should be treated better," said Mayweather Sr. "I'm not saying it bothers him but if I was in his shoes, it would bother me. "He's paying the price for being honest and for being too good. When these guys are throwing punches and he's making them miss, people call that boring. "They don't know boxing, that's the problem."